A simpe and savory meal for a weekday win. Weekdays call for really easy dinners but that doesn’t mean we need to sacrifice on taste! I love that this simple bowl is made with staples in my fridge and packed with flavor and different textures. 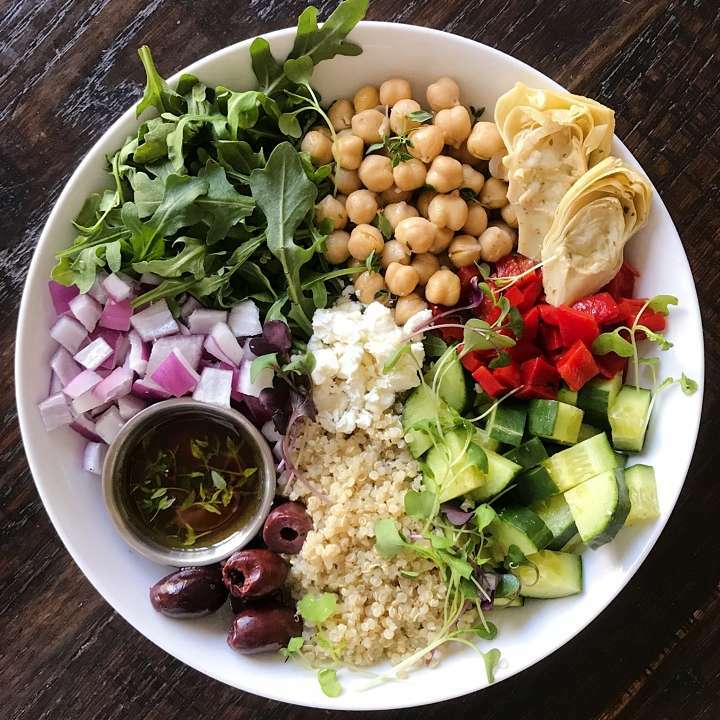 Fresh arugula, chickpeas tossed with olive oil and fresh thyme, roasted red peppers, fresh cucumbers, quinoa, kalamata olives, red onion, marinated artichokes and feta, all served with an easy thyme- balsamic vinaigrette and topped with micro greens. All that’s required is a little chopping 🙂 and it’s a super satisfying and delicious meal. Feel free to add grilled chicken or another protein of your choice. A simple and savory Buddha Bowl perfect for easy weekday meal. Packed with vegetables, chickpeas, quinoa and topped with a Thyme Balsamic Vinaigrette, it's satisfying and delicious! Quantities below are approximations... can adjust to tastes. Feel free to also add grilled chicken or another protein of your choice. Whisk ingredients in a small bowl or liquid measuring cup till well combined.. Set aside. Toss chickpeas with ½ teaspoon of olive and fresh thyme. Place each ingredient in a different section of the bowl. Toss with dressing to taste. Top with micro greens. Serve & Enjoy! Save any remaining dressing in a sealed jar and store in refrigerator for several days.